Joy Gregory’s work explores the issues of fragmentation, layering, dichotomy and contradiction that have formed the relationship between Europe and the Caribbean since the arrival of Christopher Columbus in the New World. The important elements within Gregory’s work have to do with storytelling. Her journey in “Memory & Skin” begins and ends with the sea tracing shadows of movement, memories and trade. This story is not a singular voice with a shared history. Here Gregory pays tribute to the millions of people who lost their sense of history, culture and identity - and often their lives - in the foreseeable movement of Africans from their homeland. The installation includes the use of objects, photography, video, sculpture and sound. Each element of the piece echoes and recalls similar stories from different places with familiar places. The objects presented are personalised through their relationship to the places they have come form and the people to whom they belonged. “Lost Histories” is a recent non-directional piece where the viewer is presented with a number of evocative titles. It is through these combined with the enigmatic small scale images that a personal reading of the story triggered for the viewer. It takes fragments (which are not necessarily related) and places them in an order (which is not necessarily logical) to tell a story. Like history this work is not simplistic nor linear, it has many layers. Most importantly it is the creation of personal stories which relate the past to the present and establishes some identity for an individual and /or a group on which to hold. “Cinderella Tours Europe” comprises up to 9 colour prints. This particular fairy story is about desire as the other. The People of the Caribbean are wrapped in the narrative of Cinderella transformed into a pair of golden shoes which are transported around the major sights/sites of Europe. On this Grand Tour the shoes are photographed in front of familiar landmarks in the style of so many tourist photographs. Joy Gregory has achieved international status as a photographer and artist and has exhibited at major photographic and fine art festivals in Arles, Johannesburg, Istanbul, Santiago and San Paulo as well as in galleries at home and abroad. Her work is in many private and corporate collections including the Arts Council of England and the V & A. She is Senior Lecturer at the London College of Printing and is represented by Zelda Cheatle Gallery. On ... Joy Gregory conducts a guided tour of her exhibition and talks about her work in the gallery. 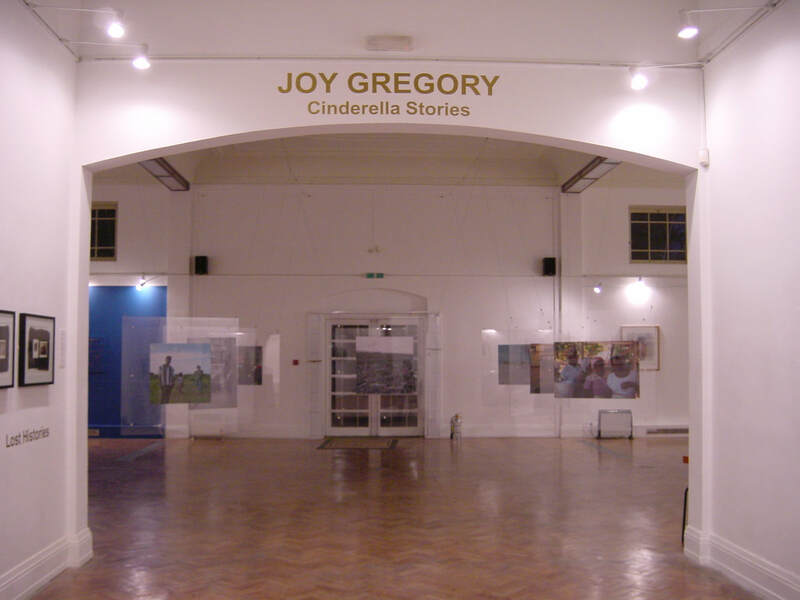 Please call PMG on 020 8567 1227.To coincide with Black History month, Pitshanger Manor Gallery is pleased to present this solo exhibition by Joy Gregory and features “Memory & Skin” together with “Lost Histories” and a new OVA commissioned work funded by London Arts, “Cinderella Tours Europe”.